In 2014 I was invited by the City Gallery in Wellington to curate a ‘Frock Room’ as part of Creamy Psychology, a major retrospective exhibition of photographer Yvonne Todd. 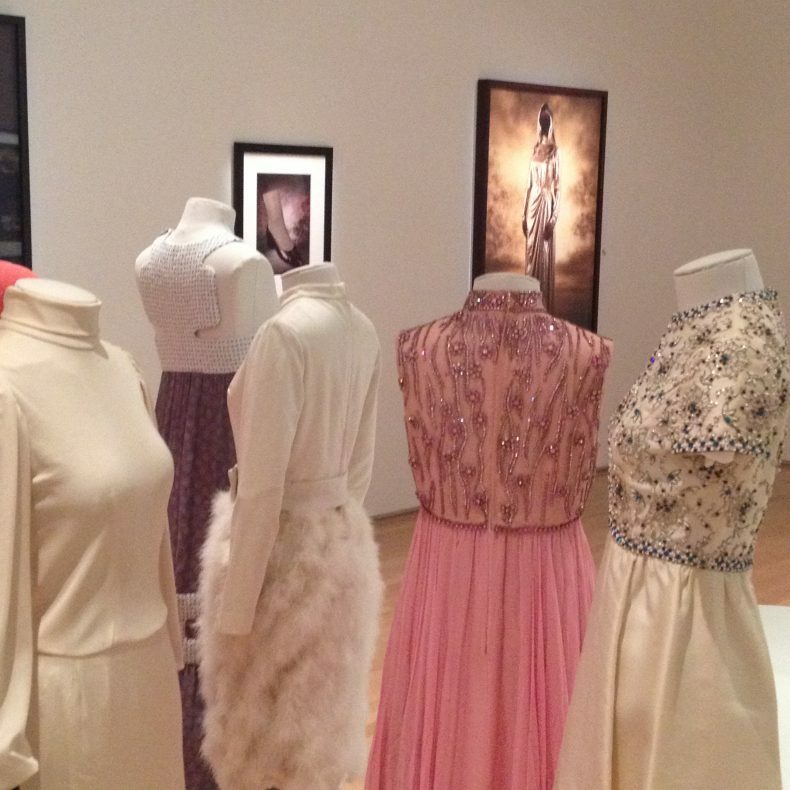 The ‘Frock Room’ featured glamorous gowns from Todd’s personal collection which she used to create portraits of various women, real and imagined. I am currently working with Yvonne and Te Papa’s textile conservator Anne Peranteau, to mount an expanded version of the ‘Frock Room’ for the Tauranga Art Gallery. Fictitious Bodies: Costume in Yvonne Todd’s Photography opens this Saturday 3 September alongside a new suite of work by Yvonne curiously entitled Barnacles. For her new series, Yvonne draws upon her recent experience of pregnancy and motherhood. She has dressed her models in costumes of her own design which resemble oversized bibs, mittens and quilts. In comparison, Fictitious Bodies jumps back in time, and includes works from 2002 to 2010. The garments in Fictitious Bodies date from the Late Victorian period to 1995. All of the garments have been used by Yvonne to materialise a retinue of intriguing, and at times disturbing, women, from a burger heiress to a Sci-fi Madonna. Yvonne purchased the dresses online from American-based vintage and celebrity couture dealers in the years before the Global Financial Crisis hit New Zealand, and in turn the artist’s credit card. The collection includes a dazzling sequined dress formerly owned by pop diva Whitney Houston, which Todd used to create Gold Study (Female), 2007, and dresses worn by Liza Minnelli and Carol Channing. They are being exhibited alongside 13 of Todd’s most glamorous, yet off-kilter, female portraits, and a single ‘silver-haired fox’ from The Wall of Man. The two Victorian dresses on exhibition feature in one of my favourite Todd series, the Vagrant’s Reception Centre (2005). When the dresses arrived from the States, Yvonne discovered that they did not fit the models she had intended. The dresses were simply far too small for any 21st century woman to squeeze herself into, corseted or not. Much to her frustration at the time, she had to engage 11 to 12 year old models. The resulting images, however, are compelling. Werta, 2005 from the Vagrant’s Reception Centre wears a woollen skirt and bodice dating from c. 1895. Image courtesy of Yvonne Todd. The Victorian dresses also posed issues for display in the gallery, as neither fit on any sort of standard mannequin type. This is where Anne, thanks to National Services Te Paerangi’s (NSTP) Expert Knowledge Exchange programme, came to the rescue (again). Through the exchange programme, NSTP was able to send Anne to Tauranga to teach Sarah Broad, the gallery’s exhibition technician, some of the tricks of the trade in regards to costume mounting and display. This included how to make bespoke dress forms from scratch. Anne worked with Sarah to show her how to safely steam garments, make faux arms, slipcovers and pad out forms in all the right places. For example, the bodice of an unusually cut dress by Missoni that appears in Yvonne’s video work Honest Places, required a custom built bra, complete with faux breasts. Unfortunately, it is not often that you can slip a garment over the head of a mannequin and have it look great instantaneously. 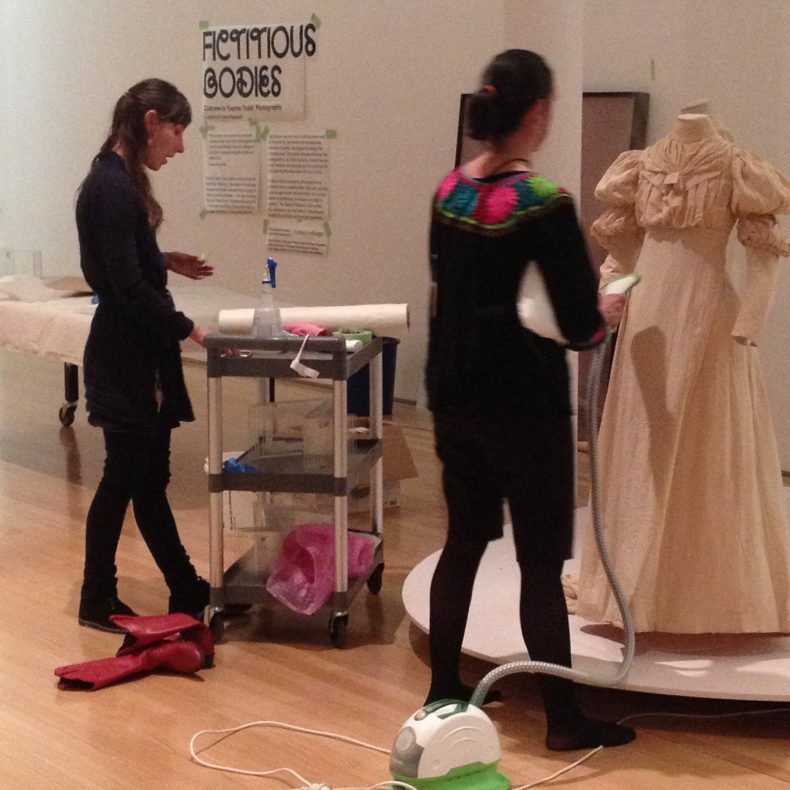 Sarah Broad from the Tauranga Art Gallery and Anne Peranteau from Te Papa work on getting the wrinkles out of a late Victorian wedding gown. The dress was so small, that they had to make a bespoke form for it. As today draws to a close, there is another five hours of patient steaming ahead before every gown looks its glamorous best, and is ready to be lit. Yvonne and I will be giving a floor talk at the Tauranga Art Gallery on Saturday 3 September at 11am. Entry is FREE, and all are welcome. Barnacles: Yvonne Todd and Fictitious Bodies: Costume in Yvonne Todd’s Photography are on display at the Tauranga Art Gallery until 6 November 2016. Supported by Cooney Lees Morgan, Te Papa and National Services Te Paerangi. I am so looking forward to to the floor talk on Saturday. I do volunteer work for The Elms and was involved in the 2003 exhibition with Joy Drayton. Rangi Te Kanawha was our advisor and to taught us a lot of the conservation techniques we used to store the collection. The clothes and Textile collection The Elms is amazing, as you say the women’s body shape in those days so diminutive, and a shame it is in storage!